Companies who care about customer satisfaction and want an easy-to-use tool to track NPS (Net Promoter Score). By focusing on NPS organizations can improve customer retention and foster growth. // 10$ =1K surveys/mo. // 35$ = 10K surveys/mo. // 99$ = 100K surveys/mo. 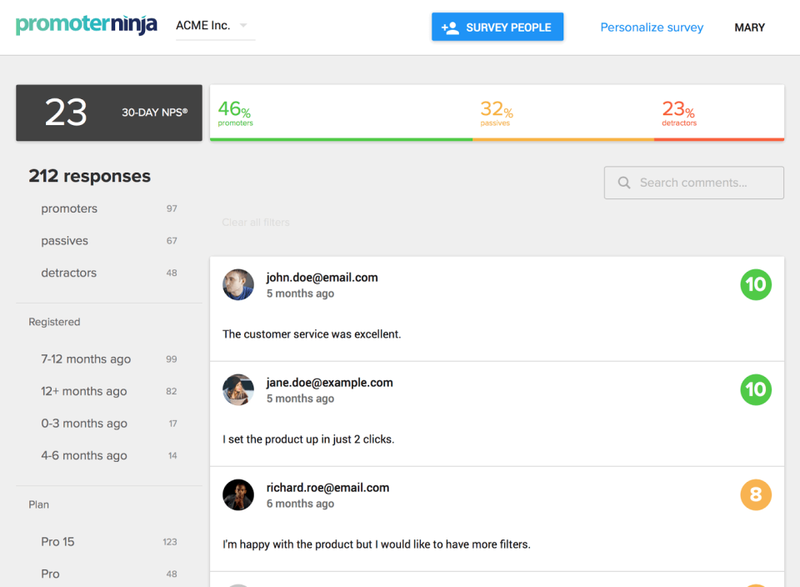 Promoter Ninja is the cheapest and simplest NPS email survey tool to monitor customer satisfaction. Upload your customer contact list, customize your NPS survey and send in just a few clicks. Net Promoter Score is "the one number you need to grow", according to Harvard Business Review. Use Promoter Ninja to send multilanguage NPS surveys, without IT supervision and with your own brand image. First 500 surveys are on us! Get the most valuable feedback from your customers, starting at 10USD/mo. I used Promoter Ninja to measure NPS of the alumni in my online school. It worked perfectly. Pros: I am not a tech person and I could upload my users contacts and send a customized survey in just a few clicks. I used an existing CSV file that I had with my segmentation criteria. It was very easy to segment the NPS afterwards based on my own data. I am now improving my online school for teachers based on the feedback I got with Promoter Ninja. Pros: Promoter Ninja has a GREAT price for the value, the best on the market as far as I know. It's a simple tool, with nice UX, and pretty simple to customize and start getting results..you can be up and running in 5 minutes after registering, and start getting NPS feedback! Cons: Sometimes I would like some advanced features. I hope this comes with time as I see it's in constant evolution during the 9 months that we've been using it. Overall: price, ease of use. Amazing simple product. It does what it says and it's the cheapest I've found. Pros: The survey setup is extremely easy. Uploading a CSV is the most flexible way to segment my customer base. My NPS is measured in real time as customers answer the surveys. Cons: It would be great if it provided a web version of the survey for users that do not provide e-mail. Overall: Real-time customer feedback and actionable insights. Thanks for the feedback! We are considering adding the website survey.